EVOLUTION MOTO 10W-30 is a fully synthetic motorcycle oil engineered to protect your engine, clutch and gears while providing considerable fuel savings. 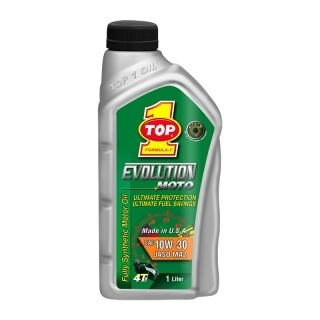 EVOLUTION MOTO 10W-30 is designed with the latest technology in additives that are optimized for motorcycle performance where lighter viscosity oils are recommended by OEMs. This oil was designed under a partnership with the largest motorcycle manufactures from Japan. It has been tested and proven to provide a minimum fuel savings of 5.8% over an average 20W-50 and still provide the protection necessary for high performance motorcycles. EVOLUTION MOTO 10W-30 is registered not only with JASO but also with HMEOC (High quality Motorcycle Engine Oil Conception) which is a new board managed by SAE Asia to ensure the newer generation lighter viscosity oils properly protect motorcycle engines, clutches, and gears.